Bubble Guppies is an interactive children's show that runs on Nick Jr. The show offers little ones the chance to learn about a whole matter of real issues within the fantasy world inhabited by merperson pre-schoolers, deep down under the sea. Fisher Price have recently launched an exciting new range of Bubble Guppie toys suitable for fans of 18 months and over. 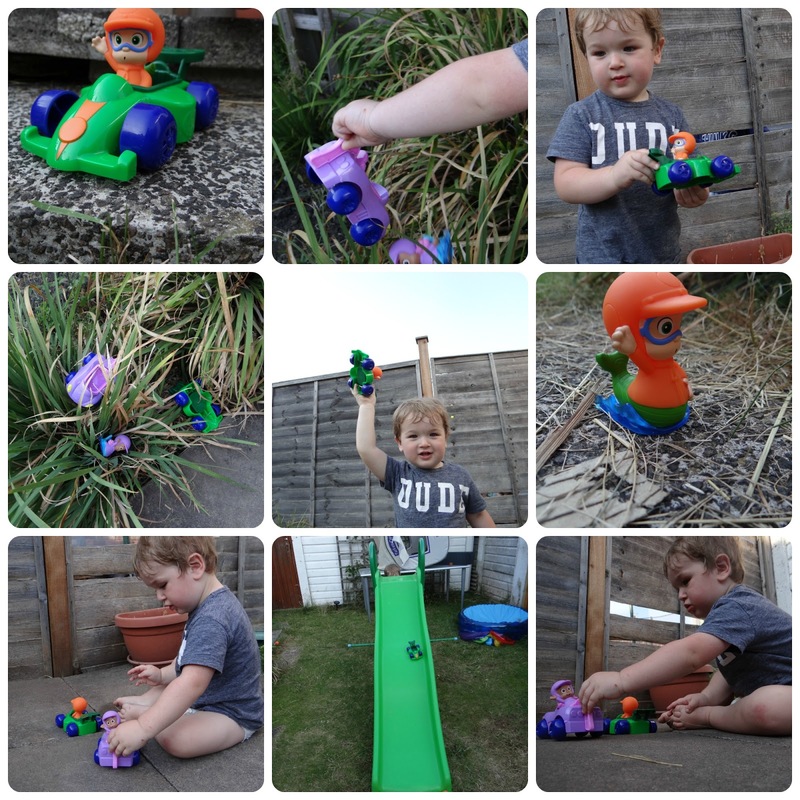 Leo has been sent a selection of the new toys to have a play with, and over the past couple of weeks we have been having a serious play so that we can give you our honest feedback. At the moment Leo is just loving anything and everything that he can push around, anything that resembles a car. I knew that the racing vehicles were going to be a big hit, so I presented these two toys to Leo first. As suspected Leo spent the rest of that evening (and everyday since) playing with his racers. With the nice weather he even spent a great amount of time out in the garden posting the cars and their occupants down the slide. At the end of each slide Leo would exclaim 'more' and run to pick them up only to repeat the process again and again. 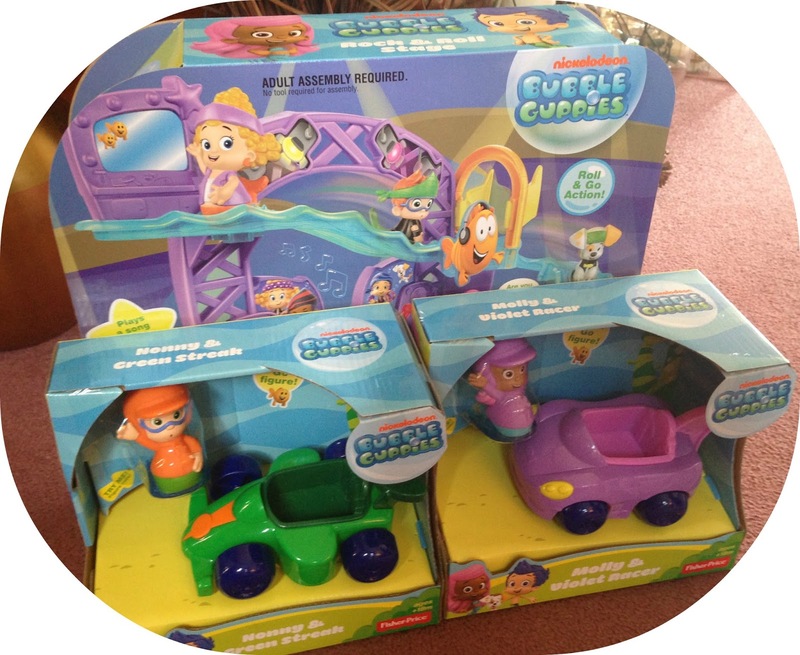 The cars are both brightly coloured, Molly comes in a bright Violet colour and Nonny in a lush Green. The characters are easy to put into the cars and actually clip in so that you can drive them round pretty fast and they can withstand a few bumps (or a trip down the slide in Leo's case). They are perfectly designed for little hands to play with and there are no little parts that you have to worry about them putting in their mouths. The characters have little roller balls underneath so that you can roll them along the floor and use them separately without the cars. Leo has even been using Nonny and Molly in conjunction with the Rock & Roll Stage, so the possibilities are whatever you make them. The Bubble Guppies Rock & Roll Stage was a toy that I was actually a little skeptical of in terms of how much play value Leo may get form it. In fact I really didn't think that Leo would be very interested at all and actually waited a few days to open it up for him to play with. This was when I discovered how wrong I was. I found the entire assembly process very straight forward and in true 'Laura' style, I neglected to look at the instructions (So it can't have been hard at all). Once the batteries are in that is when the Rock and Roll Stage truly comes alive. 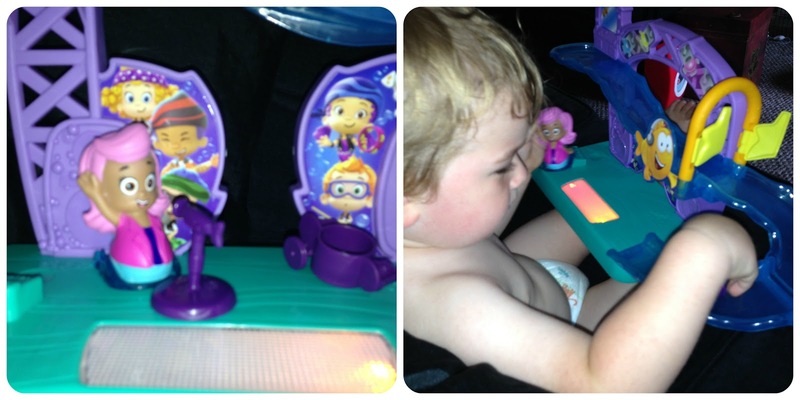 There is music brought to you by the Bubble Guppies and lights a plenty. If you want more music or sounds you can keep pressing the centre button located at the front of the stage. 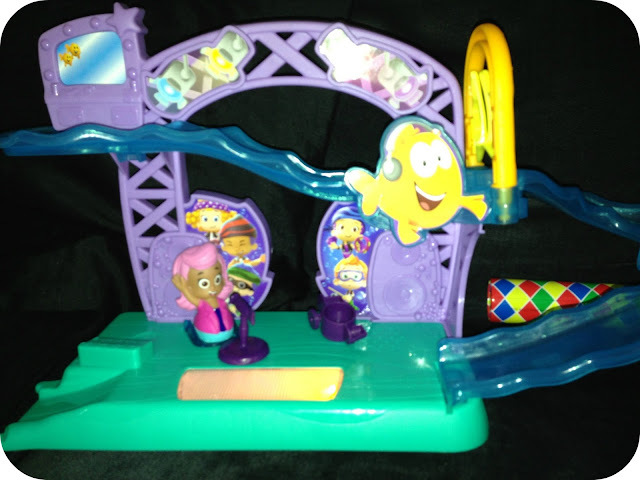 Leo has been rolling each of his 3 Bubble Guppies down the attached ramp. The set comes complete with a rolling Molly and 3 play pieces including a drum set, microphone and Rock and Roll Lobster. After my initial reservations about this set, it turns out I could not have been more wrong. It has and continues to provide excellent play value for Leo. Leo has really loved this new set of Bubble Guppie toys and I forsee them sticking around at the top of the toy box for some time to come yet. 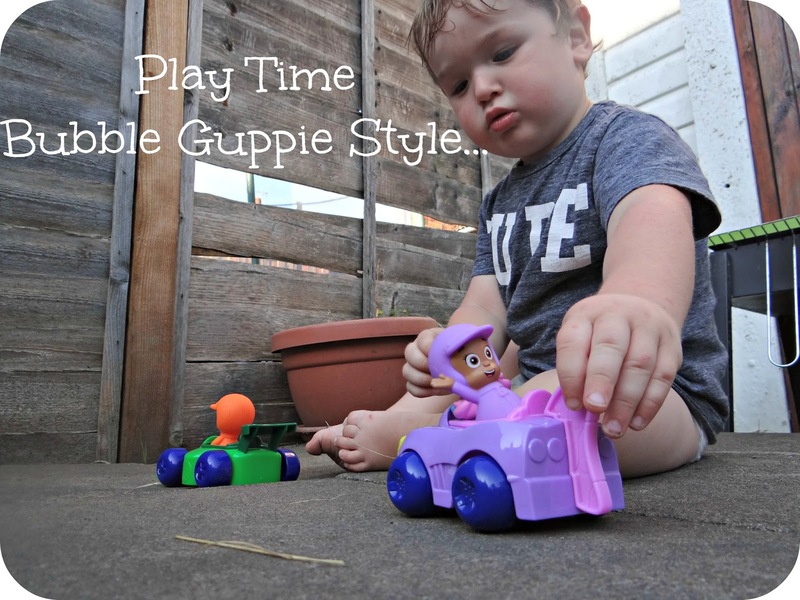 Disclaimer: I was sent the Fisher Price Bubble Guppie toys for the purpose of this review. All views and opinions expressed are completely honest and my own. Thanks for your review, Laura. Lara hasn't seen the TV show yet, but keeps talking about the toys after seeing an advert and then viewing them in Toys R Us. Thanks to your great review I now know they are definitely worth adding to the ever-growing wish list!